Curcumin 2k is a dietary supplement that is advertised to promote brain health, joint health, cognitive function and mood balance. Curcumin is the primary active constituent found in the turmeric plant. It is a yellow colored spice that has been used in traditional medicine to promote healing, circulation, and anti-inflammatory effects. Curcumin is an antioxidant that is purported to support wellness and healthy aging, improve joint pain and promote immunity. Curcumin2k from Stop Aging Now contains two active ingredients: turmeric root extract with 95% curcuminoids and BioPerine®, a black pepper extract. Combining turmeric with BioPerine is purported to increase absorption of this ingredient from the gastrointestinal tract, resulting in a dietary supplement with up to 2000% greater oral bioavailability. Curcumin 2k by Stop Aging Now is a dietary supplement that provides 1330 mg of full spectrum turmeric extract. This extract is formulated to provide 95% curcuminoids, including curcumin, demethoxycurcumin and bisdemethoxycurcumin. Historically, turmeric has been used as a healing herb and culinary spice for thousands of years throughout Asia. Curcumin is one of the main active compounds found in turmeric that has been shown to have various health benefits. It is primarily used to improve joint pain and swelling, detoxification, healthy blood lipid levels, brain health and gastrointestinal comfort. The Natural Medicines Comprehensive Database rates Curcumin as Possibly Effective for improving symptoms of osteoarthritis, which is the most common form of arthritis. However, the FDA has not approved this supplement as a drug for the prevention or treatment of any medical conditions. Research shows that curcumin can support normal insulin sensitivity. It has also been shown to improve levels of total cholesterol as well as ratios of low-density lipoprotein (LDL) and very low-density lipoprotein (VLDL) cholesterol. Curcumin2k is a curcumin supplement designed to increase the bioavailability of the active ingredient. This refers to the amount of the ingredient that reaches its intended target in the body. Curcumin has low oral bioavailability when taken on its own. Large doses are not well-absorbed into the bloodstream and are rapidly broken down in the gut and liver. Curcumin2k is enhanced with 20 mg of BioPerine® – a proprietary brand of piperine from black pepper extract. This supplement combination is formulated to to increase curcumin’s absorption and prevent its breakdown in the small intestine and liver. Research shows that co-administering pipeline can increase the bioavailability of curcumin by 2000% in both animals and human subjects. Each serving of Curcumin2k contains 1330mg of turmeric root extract and 20mg of BioPerine® black pepper extract. Curcumin2k comes in the form of veggie capsules. Its usage is intended for adults only. According to the manufacturer, the suggested dosage is two capsules daily, preferably with a meal and as directed by your physician. Curcumin2k by Stop Aging Now also contains cellulose, vegetable magnesium stearate and silica. This dietary supplement is free of milk, eggs, fish, shellfish, tree nuts, wheat, peanuts and soy. Curcumin2k is manufactured in the United States in an FDA inspected facility so as to meet the standards of US Pharmacopeia (USP) for purity, quality and potency. Curcumin is generally well tolerated and does not cause adverse reactions in the majority of users. Negative effects reported are typically limited to mild stomach pains. If you are pregnant, nursing a baby, taking any other medications or have any history of liver, gall or gastrointestinal problems, it is recommended that you consult a physician prior to use so as to avoid adverse effects. Testimonials on the website of Curcumin2k’s manufacturer, Stop Aging Now, are generally positive. Users who take this product say that it has helped their joint pain, strengthen their memory and improve muscle discomfort. Not all users experience positive effects from taking this supplement. Some say that it caused them mild stomach discomfort. Some report that they switched to another brand due to the high price of this supplement. 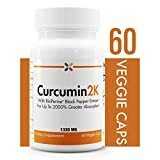 You can buy Curcumin2k on Amazon in bottles that contain 30 capsules each. There are also options to buy 3 or 6 bottles at a time and save money by purchasing in bulk. You can also order Curcumin2k online through the manufacturer’s website. One bottle costs $29.95 and will last for one month taking one serving per day. The active ingredient in Curcumin2k has been shown to support joint comfort, provide relief from occasional muscle pain and support normal inflammation regulation in the body. Curcumin2K is purported to be 2000% better absorbed in the bloodstream than other forms of curcumin due to the inclusion of Bioperine® black pepper extract. This makes it more effective than other dietary supplements that provide turmeric in a single-ingredient formulation. However, there are other brands of curcumin supplements available on Amazon and from other retailers that contain piperine extract at a lower price. Consumers should examine the available products in conjunction with their doctor to determine which best suits their needs. Shoba G, Joy D, Joseph T, Majeed M, Rajendran R, Srinivas PS. Influence of piperine on the pharmacokinetics of curcumin in animals and human volunteers. Planta Med. 1998 May;64(4):353-6. doi: 10.1055/s-2006-957450. Chandran B, Goel A. A randomized, pilot study to asses the efficacy and safety of curcumin in patients with active rheumatoid arthritis. Phytother Res. 2012 Nov;26(11):1719-25. doi: 10.1002/ptr.4639.